An irrigation audit – essentially – is an evaluation of an irrigation system’s performance. The results provide a road map on how to improve irrigation performance. It takes a trained professional, knowledgeable in irrigation and the audit process, to develop an effective irrigation audit. There are three steps in developing an irrigation system audit. Step one – is to test the system to confirm that all of the irrigation system components are functioning properly. Often times, significant water savings are achieved by simply fixing and adjusting the existing irrigation system. 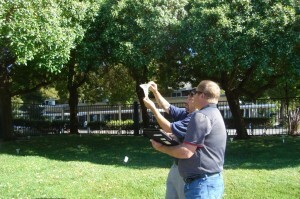 Step two – is to field test each zone of the irrigation system. Each irrigation zone is operated. The precipitation rate and efficiency of each irrigation zone is collected under actual operational conditions. Step three – in an irrigation audit is to calculate irrigation schedules that are based on plant type, soil conditions, weather patterns, and field test results. 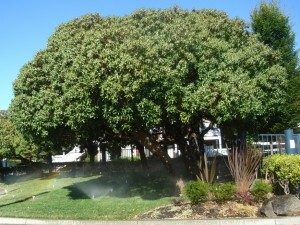 Gardeners’ Guild has had many years experience doing irrigation audits. In fact, we’ve been a pioneer in the area of water management and have been recognized for numerous awards by the Marin Municipal Water District (MMWD). We’ve played a leading role in the development of the Turf and Landscape Irrigation Best Management Practices. The photos in this blog are from an audit we did this summer at one of our sites in Richmond. The winter season is a great time to audit irrigation systems, develop systems improvement plans and ready systems for the next irrigation season. The audit process is a very reliable and easy process for analyzing sprinkler distribution uniformity and efficiencies. Once the audit data is collected a plan can be developed for repairs and improvements. And with the wide array of water conserving controllers, sprinklers and drip components available to the landscape professional it is not uncommon to achieve water savings in the 30% range. Making the ROI on systems improvement very attractive. Thanks for sharing excellent informations. Your website is very cool. I’m impressed by the details that you have on this blog. It reveals how nicely you perceive this subject. Bookmarked this web page, will come back for extra articles. You, my pal, ROCK! I found simply the information I already searched everywhere and just could not come across. What an ideal web-site.